A good sunny Friday afternoon while I was enjoying a cup of hot steaming brewed coffee, a girl came asking if someone is home as they were from Safety Organization of the Philippines (SOPI) and wanted to discuss fire safety in our household - showed some fire hazards and even did an amazing demonstration of fire handling procedures with our gas stove and LPG tank. It seems to be an entertaining circus show that motivates you to think about your safety and get their products instantly. Mode of Syndicate Operation: These sales person, a lady at first (prolly because of the charming character) then after 5 minutes, 2 guys, well dressed and has ID will go after. They go and jump from one house to the other to "conduct" a survey about home fire safety. The survey results to finding out that you have an unsecured LPG connection. I presume if anyone does conduct surveys, they have a survey sheet that they fill up however these guys just have a notebook, no guide questions and just writes down your answer. 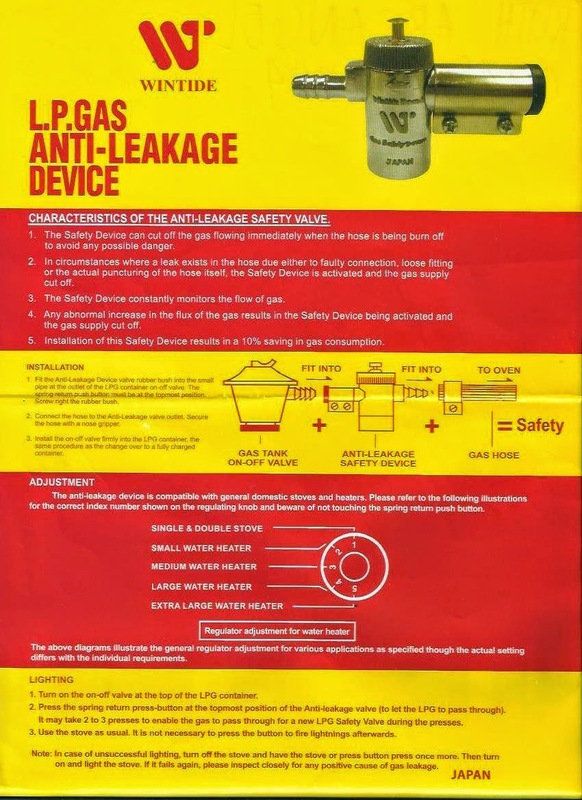 They then inspects your household on how you connect your LPG tank to your gas stove then will then say that any moment from now, your house may be caught on fire because of this hazard. They will do demonstration as to how to put out a fire just in case if the hose gets a fire - you will learn that you will either slide or flex the hose to cut off the gas source then turn off the gas valve. They bring in some hoses and categorized it as Category A, B & C and inform you that you have a garden hose and is not suitable for your gas setup. Their hose has a cut, connect it to your LPG then lit it and starts a 4 foot fire then they will easy slide up their fingers on the hole of the hose to put out the fire - then you get impressed. 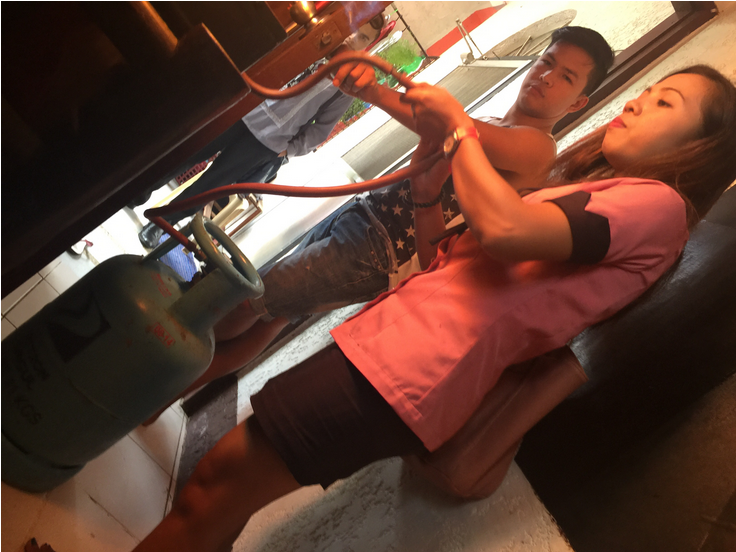 "Our organization has received numerous complaints or inquiries about the door-to-door activities of sales’ agents and other elements inspecting safety valves and hose connection of liquefied petroleum gas (LPG) tanks. These people were using the name and logo or our organization in favor of their activities. Please be informed that SOPI as well as its members does not engaged and tolerate its members from knocking on people’s door in the guise of inspecting the safety valves and hose connection of their LPG tanks and alike activities. This serve as a warning for persons, companies, and or entities who are using SOPI name without the consent of the organization." The sales lady lights up the hose with a hole on it and turned on the LPG tank to demonstrate how to put out the fire. As a result of their fire safety investigation, they will inform you that you need to replace your hose immediately for your family's safety. They will tell you that you can get this Category A hose from LM Safety Distributor, and that you need to attend a 3 hour seminar first as this product is sold only to those who attended the briefing. They will market that the product is from Japan and has great quality, the hose will cost you about Php 750.00 but if you will go to the seminar OR if you have an ID that you can present to them, it will cost you only about Php 450.00 - made me think why will you attend the seminar if you can just show your ID? Well, your ID? They will just take a picture and get your information - sounds legit eh? Then after that, they will tell you that to add more safety to your LPG setup, you need a gas regulator. They will then again show you a demo of how this works - they will connect the regulator to your tank while connecting their hose with a hole on it. They will tell you that it the regulator then stops the tank from leaking out as it detects a hole on the connection. The device will cost you about Php8,000.00 but as a promotional offer, if you have an ID, they will get you a 30% off the price. If they see that you have a government ID, they can give it to you 50% or even 70% off the original price. It has a lifetime warranty and will show you the warranty card and they said that they will do a door to door service if it needs fixing. If WinTide is a genuine product from Japan, it should be available on their website - http://www.rakuten.co.jp right? You cannot also locate any official website or Facebook page regarding this product. And when you check their receipt, they do not have the name of LM Safety Distributor, their DTI permit number or SEC Registration Number in there. They don’t even have a Barangay permit that they can go round the houses to sell this product. I have called Brgy Tisa and informed them about this but they are completely unaware about this activities. I have verified with the local council of Cebu if they have permitted selling this product and informed me that they do not have. I agree. I dont entertain or trust these people mansad who sell products door to door. Hi! We also experienced the same thing. And they placed their equipment to our LPG tank. Is it advisable to remove it and replace our previous hose? I'm really worried about our safety. Just last day i purchase this brand wintide anti leakage regulator amounting 4,998 with ñromo buy 1 take 1. All the strategy u've been said really happened to me during their demo.Of corz,i think of our safety so i buy 1.My question,do i still have to use this wintide anti leakage regulator,in which they prove in their demo naman na gumagana.Sayang nman pera ko.huhu.5K dn yon. Nia sa Ginatilan ning nga tawhana na biktima ko ani kahapon..Wala manko kahibaw nga naa na diay taga Bureau of Fire Protection ang niare agsa miage nga nag inspect so wala unta ko biktima ani giahak.